Nearly 35 years after HBCU hoops relevance in Division I was questioned, the answer remains largely the same. The turn of the calendar year happens to coincide with the start of conference play in college basketball. 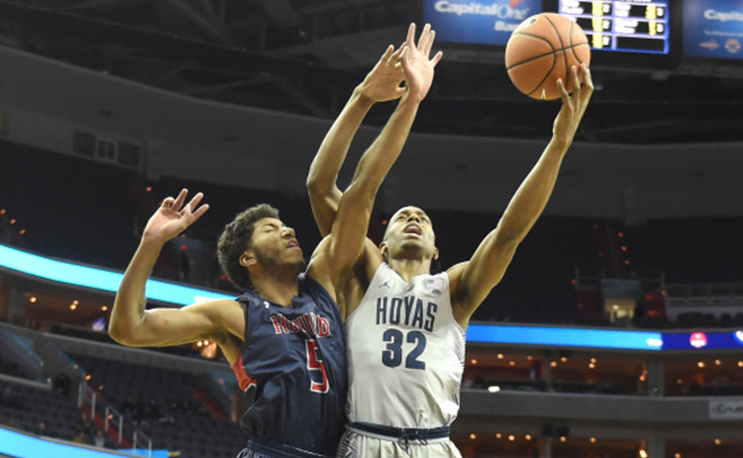 While that’s good news for the MEAC and SWAC along with other teams who have faced daunting schedules, its a time of reckoning for a team like Georgetown. After winning 10 of its first 11 games of the season, Georgetown dropped its Big East opener to Butler in a 91-89 game in which it led by as many as 20 points on Thursday. After the game, ESPN’s Jeff Goodman said what many people around the Big East were thinking. Butler comes away with the win in double overtime at Georgetown. Welcome to the Big East. It’s not the MEAC. Goodman’s tweet struck a nerve for some in the MEAC, who felt his tweet was unnecessarily harsh on the conference. While Goodman’s tweet stings for fans of HBCU basketball in general and MEAC basketball in general, it wasn’t an inaccurate one. Four of Georgetown’s wins under first-year head coach Patrick Ewing have come against the MEAC. They include wins over Coppin State (0-15), Maryland-Eastern Shore (3-11), Howard (3-12) and North Carolina A&T (7-8). Add in a win over Alabama A&M (0-13) on Saturday, and half of Georgetown’s wins have come against HBCU hoops. Unfortunately, those wins won’t even mean that much to Georgetown. The MEAC teams they played are 13-36, and only eight of those wins came against Division I competition. Only five of those came against PWIs. Experts say the team’s “horrid” non-conference schedule is likely to keep it out of the NCAA Tournament. HBCU basketball has been in the Division I ranks for over 35 years now, and despite having some big upsets, the MEAC and SWAC (and Tennessee State for that matter) have failed to build teams that can consistently compete with the big boys of college basketball. Of course, there are reasons for this (explained below) but it is an indisputable fact. Half of the SWAC’s five teams come into Dec. 29 winless. Only Prairie View, Southern and Grambling have multiple wins against DI schools. A&T is the only MEAC school with a winning percentage close to 50 (.467) but take away its wins against D3 Greensboro College and NAIA Mid-Atlantic Christian University, and it becomes a 5-8 record. The Black College Sports Review, published by the Winston-Salem Chronicle and distributed around the black press, published a story called “Up And Coming…or Down And Out…” The story focused on whether or not black colleges would ever be able to compete at the Division I level with schools like Thompson’s Georgetown or Houston’s Phi Slamma Jamma Squad. By that time HBCUs were already being left behind by recruits in favor of big-time colleges. Winston-Salem State coach and Basketball Hall of Famer Clarence “Big House” Gaines bemoaned the fact that out of the top 100 players in America, none had signed with an HBCU. “Now how in the hell can we compete with those big schools if we can’t get the top athletes?” Gaines pondered. It’s a question still being asked. Alcorn State legend Dave Whitney, whose team was the first HBCU to compete in the NCAA Division I Tournament, made the same statement that many HBCU head coaches are making as we head into 2018. Approaching 35 years since this feature was written, despite some big upsets in the NCAA Tournament over the past few decades, HBCUs find themselves in a largely similar position. While we celebrate Southern’s win over Georgia Tech and the MEAC’s trio of 15th-seeded upsets (and rightfully so), the reality is that none of those were followed with wins in the next round or NCAA wins the following year. That is what builds programs, and in turn, conferences. The article estimated that most Division I HBCUs operated on $60,000 budgets while North Carolina operated at a budget of over $1 million. The numbers may have changed, but the disparity has not. As long as that remains the case, HBCU basketball will continue to play the underdog role. As long as HBCUs, from top to bottom, must fill their schedule with money games on the road they must pay the price of being viewed as cupcakes for the big boys until they can consistently show up and eat at the table with them. I appreciate your work and this comment is not meant to disparage it. But when we write articles like this, it is akin to a comedian talking about all the beautiful women in the audience to get the quick clap without telling a joke. This article appears to represent the answer we already know to a question that has already been asked. To advance the thought process, how about exploring what can be done (even if not totally realistic) to exacerbate this issue. It is there that we can compel readers to think about what’s next as opposed to what has already happened. Again, I appreciate your work. This is just a suggestion.